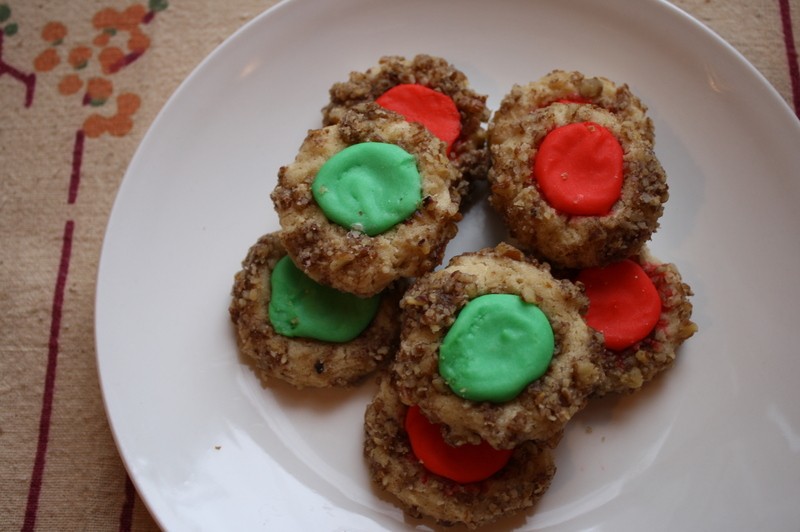 One of my favorite Christmas cookie recipes has always been thumbprints. 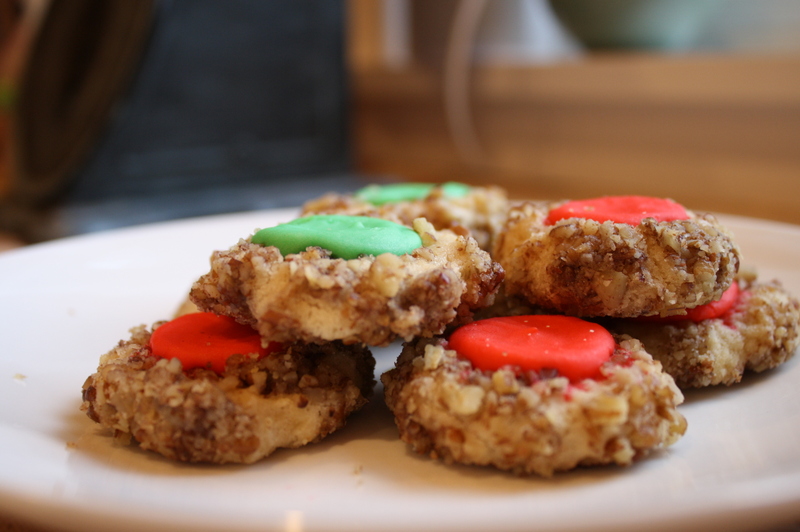 It’s a family tradition on my mom’s side, and these are one of my aunt Gigi’s specialties. My grandma and my aunt Judy always filled them with jam, but aunt Gigi made them seriously sweet and decadent with the buttercream filling-my favorite! Aunt Gigi’s also always look perfect, unlike mine, because no matter how hard I try I can never get them all to look exactly the same. These look especially sad, too, because they are the survivors of my husband’s work Christmas party (I unfortunately wasn’t able to photo before the party). 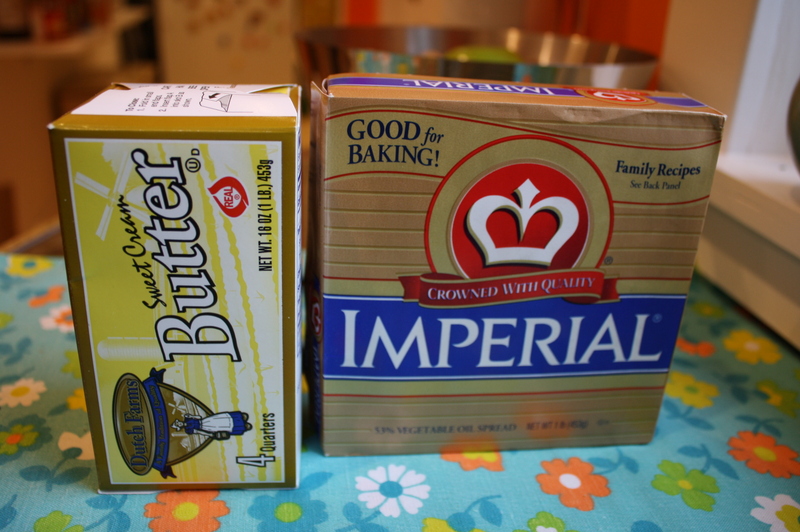 There are two ingredients in these that I NEVER use in baking: salted butter and margarine. EEK! But, I promise, it’s much better this way. I tried to make them with all butter once, and they fell into flat little pancakes and didn’t have the little thumbprint in the middle at all. And if you don’t use salted butter, you should increase the salt probably, maybe even double it. The saltiness of these cookies are what makes them so good!! Preheat oven to 350 degrees. Line cookie sheets with parchment (easier cleanup!). Mix butter, margarine, brown sugar, egg yolk and vanilla with mixer until fluffy. In a small bowl, whisk together salt and flour. Add to butter mixture and mix in until just fully incorporated. Roll 1 tsp dough into balls (I actually use a melon baller, which I think is a little more than a teaspoon). Dip in egg whites, then roll in nuts. Place 1″ apart on cookie sheet. Bake about 5 minutes, then take out of oven and make “thumbprints” (I use the end of a wooden spoon handle to make more perfect divets). Bake another 5 minutes. Remove from cookie sheet to cooling rack and cool completely. You may need to re-“divet” them again when they come out of the oven. Dealing with the egg whites is messy and sticky. It is highly recommended to first make all your balls and put them in the egg whites. Then roll them in the nuts. I also recommend not dumping all the nuts in a bowl and the rolling the balls in them…just have a little bit of the nuts in a bowl at a time. Otherwise, as you are going, the nuts will get stickier and clumpier from the egg whites. Adding fresh nuts as you go along will alleviate that situation. Cream butter in stand mixer fitted with a paddle attachment. Add vanilla and salt, and beat until fully mixed. Add powdered sugar and mix for about 30 seconds on low, and then another 30 seconds on medium speed. Add 4 tbsp milk and mix on medium-high for about a minute. Add more milk if needed. Divide, if desired, and dye each half a different color. Using a pastry bag fitted with star tip, fill each cookie with frosting. Let sit for a couple hours on rack to allow frosting to set, then set in containers in one layer (I prefer tins because Tupperware is too air tight and will make the cookies go soft, and the frosting will be too gooey. If you use a Tupperware, keep one corner of the lid ajar so that air can get in the container.) After sitting overnight, you should be able to stack up cookies in a container, putting a piece of wax paper or parchment in between each layer. Cookies will keep up to one week.